1 of 3 In a small bowl, stir together garlic, lemon zest and juice, Dijon and chopped parsley. Slowly whisk in olive oil; set aside. 2 of 3 Sprinkle tilapia with lemon-herb seasoning. Heat large nonstick skillet over medium-high heat. Spritz both sides of tilapia with nonstick cooking spray and place in skillet. Cook 3 to 4 minutes per side or until fish flakes easily with a fork. Remove fish from skillet to a serving platter. 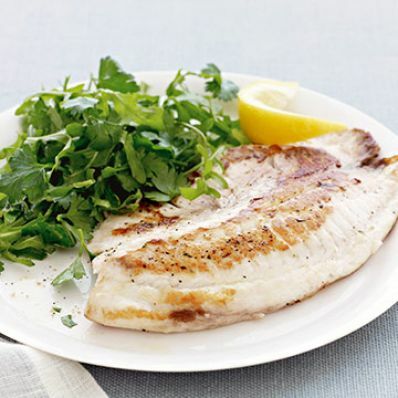 3 of 3 In a large bowl, toss together arugula and parsley leaves; drizzle with prepared dressing and serve with tilapia and lemon wedges, if desired. Per Serving: 36 g pro., 4 g carb., 215 kcal cal., 2 g fiber, 190 mg sodium, 2 g sat. fat, 7 g Fat, total, 85 mg chol.